Remember when a sandwich was a little lunch meat between a couple slices of bread? The following creations will make your grade school bologna sandwich look pretty pathetic. Here are the five best sandwiches CtrCity Anaheim has to offer in and around the Packing House, so let the lunch tour begin. Fresh baked bread piled high with meat and veggies, then smothered with melted cheese and toppings. Get your sandwich fix today in CtrCity. A well-executed grilled cheese sandwich is a work of art, and ingredients are key. Although The Black Sheep in the Packing House will use Kraft Singles on occasion (in their aptly named #7 sandwich: The Kid), but raclette is the ideal melty gooey cheese for a perfect grilled cheese. 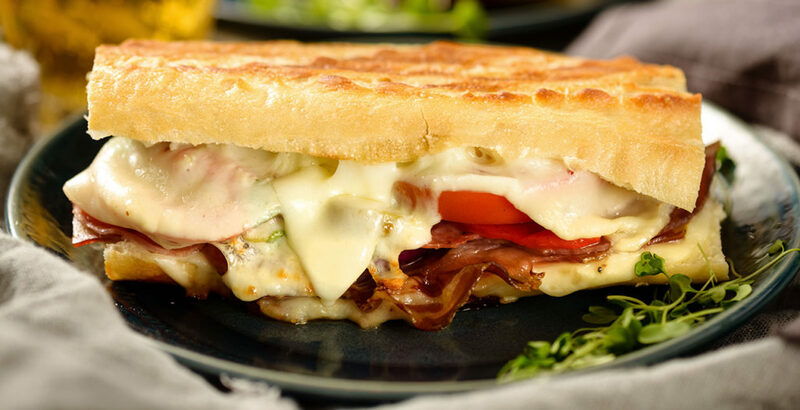 The #3 has plenty of raclette along with pickled red onions, cornichons (pickled gherkins), and potato chips (yes, inside the sandwich), all on OC Baking Company’s marble rye bread. Also in the Packing House. If you’re craving something a little meatier—or a lot meatier—The Kroft serves an outstanding porchetta sandwich. It’s made with pork belly, loin, and cracklings, salsa verde, seasoned arugula, and caramelized onions on freshly baked ciabatta. It was our top-ranked sandwich at The Kroft, but its Short Rib Melt and Prime Rib Dip were both also in the running. The Iron Press (in the Packing House) has put a new twist on everybody’s favorite sandwich: The Monte Cristo. Choose ham or turkey, then add gruyere cheese, mixed greens, and strawberry jam, then put it all on a batter-fried waffle. The Iron Press is also known for their spicy Fried Chicken waffle, a terrific selection of craft beers, and their addictive tater tots. 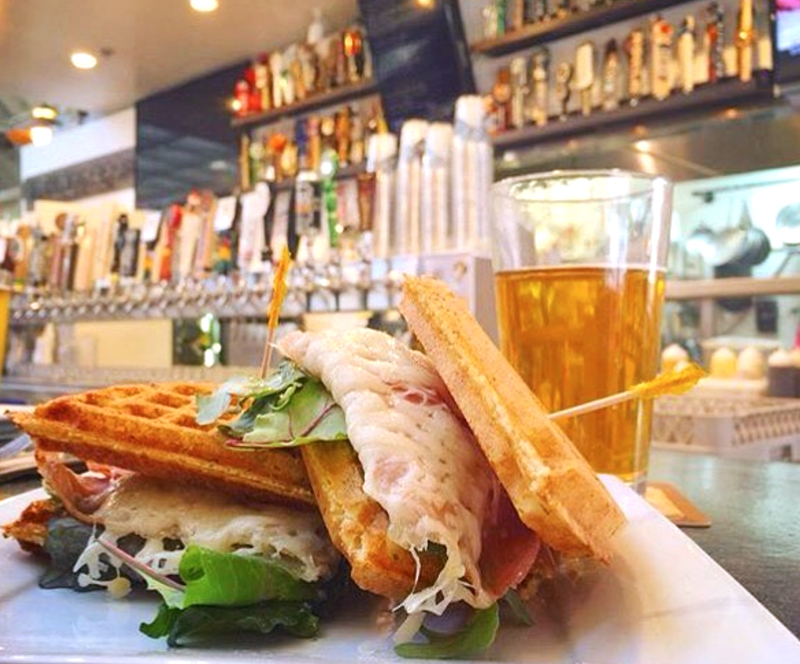 Iron Press’ famous Monte Cristo sandwich: ham + jam, smothered with cheese and greens sandwiched between waffles. Last stop in the Packing House, you’ve got to try Georgia’s BBQ Pulled Pork sandwich. This is real, down-home Southern cooking with Creole-inspired recipes. Their BBQ sauce is on the sweet side and the tender, gently pulled pork is piled high and overflowing. Their fries are amazing, but the sweet coleslaw is a great complement to the sandwich. If you’re looking for a true deli experience, head just down the road from the Packing House to Tony’s Original Deli on Anaheim Boulevard. It’s called “Original” even though they’ve had different owners over the years, but inside it feels like a step back in time with all the funky old signs and memorabilia. And it’s more than just a deli with the bottle shop and full bar. But if you’re in the mood for an authentic pastrami sandwich, this is the place. It’s enormous, heaping with Vienna beef pastrami, Swiss cheese, and pickles on rye bread. The Reuben is outstanding also, and don’t forget the potato salad. Find directions to track down the best sandwiches from our list.